If you’ve been using a dual-monitor setup for your gaming/office rig and wanting to replace it with a single monitor, then we have good news for you. The Dell UltraSharp U3415W has 34-inches curved display with massive screen real estate. It offers outstanding value for the money and is loaded with many useful features. 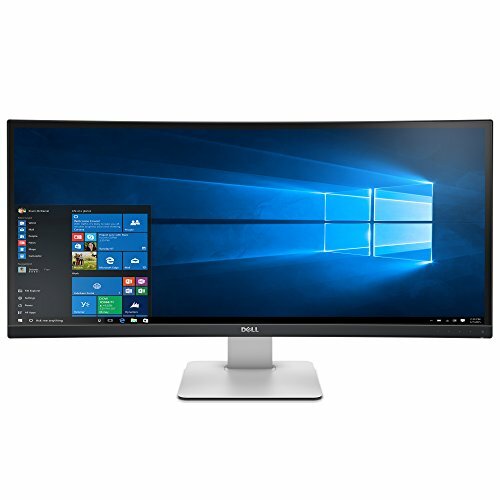 Dell U3415W uses a 34-inches IPS panel with 3440×1440 WQHD resolution. It has 300-nit brightness level coupled with 21:9 aspect ratio. It offers an impressive panoramic view that fills your peripheral vision with cinematic goodness. This monitor has an excellent pixel pitch of 0.2325mm. It’s smaller than 0.28mm, which is what the average monitors have. The small pixel pitch makes the screen look smooth. The panel has 1.000:1 typical Contrast Ratio. However, the Dynamic Contrast Ratio is rated 2.000.000:1. With 99% coverage of the sRGB color gamut, this monitor is an ideal gaming as well as workstation monitor. Navigating between multiple video inputs and application windows is made easier with the Picture in Picture (PIP) and Picture by Picture (PBP) features. The primary video input is a v2.0 HDMI. You also get six USB 3.0 ports (2 upstream, 4 downstream) to connect various peripherals. A built-in cable management solution keeps all the cables from cluttering your desktop. The monitor uses a heavy-duty stand that connects to a standard 100x100mm VESA mount. This standard mount allows you to use whatever mounting solution you want to give the monitor a better range of motion. Dell gives you an extra peace of mind with their 3-year Advance Exchange Warranty that covers labor, parts, and backlight. It’s nice to have such a long warranty for a piece of electronics such as this one. If you buy the monitor online make sure the seller is a Dell Certified Partner/Value Added Reseller. Once you get the monitor, remember to go to Dell’s website and register it. Some say the U3415W is too bland and simple. There’s no fancy design on the stand and the display itself. Gamers who are looking for something flashier to match the rest of their gaming setup should look elsewhere. This monitor’s dual tone design is subtle to make it blend smoothly in both and offices and homes. The side and top bezels are thin and hardly visible when the display is turned off. From the side, you can side the monitor is far from the slimmest in its class. That’s hardly a bad point since you will staring and the display from the front anyway. From the front, you can see the gentle curve of the display. Yes, the curve is not too apparent, but it does a fine job filling your peripheral vision for an immersive gaming and multimedia experience. A curved display keeps everything in the same plane of view. That means everything is in focus. Be advised that this is a humongous monitor. You’ll need a wide and deep desk to accommodate it. Even though the display is 34-inches, the height is not so much different compared to a 27-inches monitor. If you’re transitioning from a dual 27-inches monitor setup, you will feel familiar with your new setup. Like most manufacturers these days, Dell puts all the ports on the back of the monitor. All of them facing downward. It’s a real shame since side-mounted ports are so much better in terms of accessibility. Plugging and unplugging peripherals like MP3 players or thumb drives are so much easier with side-mounted USB ports. There are no less than a dozen ports available. You get 1x MHL connector, 1x HDMI 2.0, 1x DisplayPort 1.2, 1x mini DisplayPort, 1x DisplayPort out for Multi-Stream Transport, 1x Audio Out, 2x USB 3.0 upstream, and 4x USB 3.0 downstream (one of them is at the back separated from the other three). The two upstream USB ports give you the ability to share peripherals like a mouse and keywords with two computers. The two DisplayPort allows you to daisy-chain multiple monitors. Now, Dell’s decision to put all the ports on the back is starting to seem a bit logical. After all, for a multiple monitor setup, the side ports will be pointless. Since many still unsure what this thing supposed to do, we will elaborate on this for a bit. MHL stands for Mobile High-Definition Link. It’s a way to connect mobile devices such as tablets and mobile phones to HDTVs and monitors. Imagine you just took this cool video with your phone that you just have to show off to your friends. You just need to plug one end of the MHL cable to the micro USB port of your phone and plug the other end into the MHL port of the U3415W. Now everyone can see the cool video right on the large display. In an office setting, MHL allows you to show documents you have on your phone on the UltraSharp’s large display. You don’t need to transfer them first to a laptop before you make a presentation. An MHL cable will keep your device charged, so you don’t have to worry about it running out of juice halfway through your presentation. The UltraSharp comes in a huge box with along with the stand, user manual, power cable, USB Upstream cable, cable cover, and DisplayPort to mini DisplayPort cable. Out of the box, there isn’t much you need to do to get the monitor up and running. The heavy-duty stand and the feet are already assembled. All that’s left for you is to slide the stand into the holes at the back of the monitor. The stand locks in place securely. If you wish to pull the stand out later, you just need to press a release button, and it will slide away without a hitch. For those of you who prefer wall mounting using a monitor arm, the VESA 100×100 attachment is also easy to work with. The standard VESA attachment works well with numerous aftermarket wall-mounting solution. The stand is sturdy and keeps the monitor balanced perfectly. It has tilt, swivel, and height adjustment making sure you have the most comfortable viewing position. There are no physical buttons on the monitor. Instead, you get four capacitive soft-touch buttons located at the bottom right part of the display. Their responsiveness leaves much to be desired. Sometimes the buttons require two taps to register a press. Worst of all, they’re not labeled. They’re just four dots next to the monitor’s power button which is, thankfully, properly labeled. Pressing the soft-touch buttons open up the OSD settings. From there you can adjust the color, brightness, audio, gamma, and inputs. There are seven presets available (Standard, Movie, Game, Multimedia, Paper, and Custom). There’s also Uniformity Compensation setting to ensure color and brightness remain uniform on all screen area. The menu structure is easy to understand, and tweaking anything feels straightforward. One nice feature of the buttons is that you can set two of them as shortcuts for features that you use frequently. You don’t have to dig deep into the submenus just to do simple things like adjusting the sound or input source. The Dell UltraSharp u3415w comes with a calibration report, so the image quality is already excellent right out of the box. This monitor has a good balance of excellent color reproduction, tone, and saturation. You only need to do minor tweaks to suit it to your liking. The first thing you may want to tweak is the brightness since Dell can’t possibly know what their customer’s ambient lighting will be. Once you tweak that, you’re ready to play your games. The blacks on the UltraSharp are deep black instead of dark gray with brilliant whites. The IPS panel also able to reproduce every single shade of gray in between. Every bit of shadows and highlights are displayed perfectly. The viewing angle is as excellent as one can expect from an IPS panel. Colors and brightness remain uniform when you change your viewing position. One undesirable trait of an IPS panel is backlight bleed. For the U3415W, you can see it on the corners when the content you’re seeing has many dark scenes. The U3415W has 3440×1440 resolution. It’s a breath of fresh air from the “old” 2560×1080. It’s amazing how something that was regarded as wide is now considered too narrow and limiting. With a 3440×1440 display, more pixels are crammed into the wide 34-inch display. It’s amazing how a monitor this size is becoming the norm these days. What used to be a luxury item has starting to gain traction as a staple for gamers and those who do a lot of multimedia works. A 3440×1440 resolution coupled with the 21:9 aspect ratio translates to a massive real estate on the screen. Your favorite games get a better cinematic look on them. Watching movies becomes a real treat too. With a pixel pitch of 0.2325mm, the details are amazing on this monitor. You can see more in games, movies, and pictures. It’s clear that Dell makes this monitor not only for gamers. Professionals who need to work with Adobe Photoshop and Illustrator also love it. The average Delta E is so small (< 3), they don’t have to do much tweaking using the color wheel. The sheer size the UltraSharp lends itself as a great monitor for multitasking. You no longer need a dual-monitor setup. Opening up to four windows, one on each corner, on the U3415W still gives you 860×360 window each. That’s still a good size for you to do any meaningful work. Switching to a single monitor also saves you a lot of desk space. With 5ms response rate, you can see some minor ghosting when you have a very dark background. Input lag, however, is practically non-existent. The U3415W is very capable in handling fast action games. Note that you may need to scale down the resolution if you want to use this monitor for Microsoft Office stuff. On 3440×1440, some consider the text is super tiny. They need a magnifying glass to read the text at that resolution. It’s highly subjective, though. Make the adjustment when you feel that it is necessary, not because others are doing it that way. The U3415W maximum refresh rate is 60Hz. It’s miles behind many 34-inch ultrawide monitors that can offer 100 or even 144Hz. That’s one of the biggest reason why this monitor is so affordable. Yes, yes you can. If you have two identical monitors where one is running at 60Hz and the other is 100Hz, you can clearly see it. The difference is massive especially for fast-paced games. That being said, a 60Hz monitor is far from shabby. It’s fluid enough for many modern games, and it’s certainly fluid enough for action movies. One of the biggest advantages of a 60Hz display is that you don’t need a top-of-the-line graphic card to drive it. An NVidia 980 Ti or Radeon R9 Fury X is more than enough to power this monitor. Heck, even a 970 will do just fine. You can run your game at fairly high detail with an NVidia 970. Despite the huge screen and high performance, the U3415W only draws 46 Watts in Standard mode and 55 Watts in Movie mode — a fairly moderate power draw for something this huge. If you compare it with its little brother the UP3214Q which draws more than 80 Watts, the U3415W is insanely power efficient. Two most notable features this monitor has are Picture in Picture (PIP) and Picture by Picture (PBP). It’s weird how display manufacturers seem to forget to include these two handy features on their lineup. Well, at least Dell doesn’t forget to include them on the U3415W. The PBP feature on the U3415W allows you to display two input sources simultaneously side by side. For example, you can have a game console running on the left portion and a browser on the right. Having two 16:9 images occupying this 21:9 monitor will leave black bars on the top and bottom portion of the screen. Still, it works wonderfully. With the PIP you can play a game on full screen while having a small inset of another window open. It’s a nice feature for us who love to chat with friends while playing our favorite games. One annoying thing about using PBP or PIP on this monitor is that you can’t set the sound priority. Every time you use this feature, you have to dig into the menu to set the sound source to one of the windows. The U3415W has two 9-Watt speakers built in. Suffice to say they are not going to rock your room with high-fidelity audio. However, for casual gaming, listening to music, and watching movies, they’re more than up for the job. Considering that some 34-inch monitors only come with 2 or 7-Watt speakers, the speakers on the U3415W are certainly more powerful. Excellent image quality out of the box. Great for games, multimedia, and office works. There’s so much to like from the UltraSharp U3415W. The curved display, its brilliant colors, and 60Hz refresh rate offers gamers a captivating gaming experience. But this monitor is not only great for gamers. Professionals will love how crisp and clear the text is. You are also blessed with the extra real estate a 21:9 aspect ratio is offering. Multitasking is much more swift and seamless with this ultrawide monitor compared to a two-monitor setup. The price tag is also an attractive point. A 34-Inch Ultrawide monitor for less than $1000? Who wouldn’t want it? The Dell UltraSharp U3415W is so affordable especially when you compare it with the ASUS ROG SWIFT PG348Q or Acer Predator X34 that are more expensive.